The Absaroka (Ab-sor-ka) backpacking program was developed around Leave No Trace. 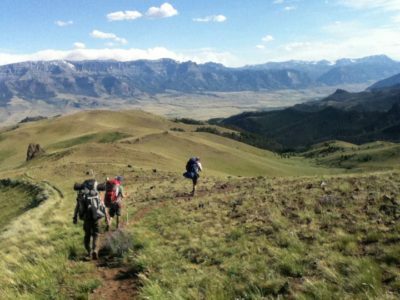 Participants hike between 7-10 miles a day through the 704,529 acres of the Washakie Wilderness, some of the most remote territory in the Lower 48. This area ranges in elevation from 6400 to more than 13,000 feet. Our treks have a distinct wilderness flavor that is not found in other high adventure programs. Backpacking participants must arrive on Sunday by 4 PM as they leave for the trail first thing Monday Morning. Come prepared with all of the equipment in the trek gear list. Our staff will conduct a shakedown on Sunday afternoon. Those who aren’t properly equipped will not be allowed on the trek. A limited quantity of loaner equipment is available. Scouts should bring a small personal first aid kit for minor cuts and scrapes. A large, crew first aid kit will be provided by YHAO. The weather on this hike can vary greatly. Morning can be below freezing and afternoons can be as high as 90 degrees. Rain, snow, and hail are possible. The air is quite dry and many hikers experience dry skin and chapped lips.